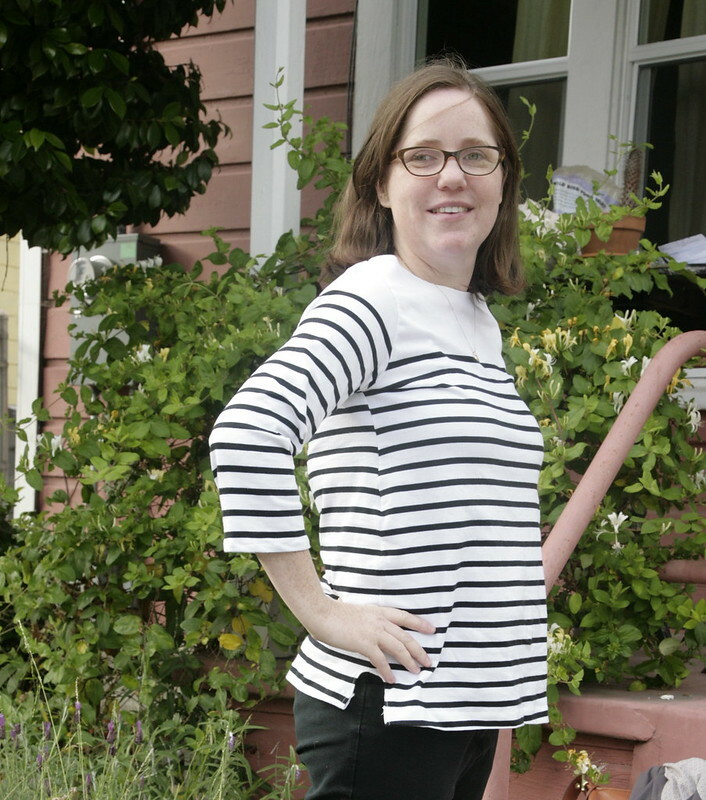 Inder Loves Folk Art: Sew U Home Stretch - Breton Top. Sew U Home Stretch - Breton Top. This top was really inspired by the fabric. I found this cotton jersey that has panels of stripes and panels of solid cream at Stone Mountain a couple weeks ago - the fabric is clearly intended to be a Breton top! I have never seen anything like this fabric, and I can't find any examples of it searching the internet. It was so cool! I knew I had to have it, and I didn't waste much time sewing it up. Home Stretch includes three basic patterns (crew neck, raglan, and a dress) with instructions on how to change them to make a bunch of different looks. So first, I whipped up a muslin of the basic crewneck pattern block to check for fit. I went by the fitting guide in the book and cut out a size medium based on my bust measurement. But it was pretty big, especially around the rib cage and under the arms. And the neckline was super unflattering on me. So I took it in a bunch, cut the sleeves to cap length, cut the neckline lower, and used some clear elastic on the neckline. This was my first time experimenting with clear elastic on knits, and I had no idea what I was doing. The neckline turned out stable, but a bit wavy - I think I need to stretch more while I'm sewing. So that's something I want to keep working on. But with all of those changes, I decided it was acceptable for jogging in. 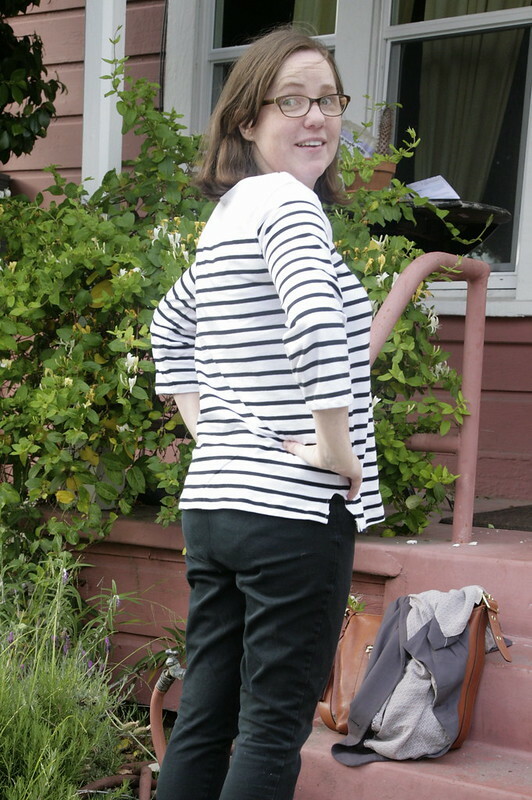 Here is a dark cell phone photo of me about to go for a walk/jog around Lake Merritt in my "joggable muslin." 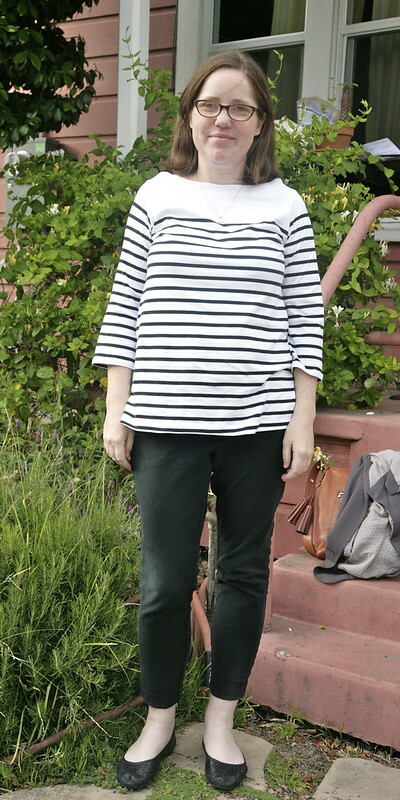 For my Breton top, I cut the top out in a size small and made the pattern modifications for the boatneck and hem suggested in the book. Based on reading pattern reviews online, I knew that the neckline was bra-strap-exposing, so I made it narrower. But even with those changes, the finished shirt was still pretty big, and I still had to take it in a lot in the sleeves and rib cage area. And the neckline, reduced in width by almost 2 inches, is still wide and exposes my bra straps! I wanted the top to be roomy and a little slouchy, with wider sleeves, but it's a balance - it has to look like intentional ease, not like you're swimming in it. So there was a lot of after the fact adjusting to get things to a wearable point. As a result of all this adjusting, my (for me amazing) efforts at stripe matching got a little messed up in the final product. Oh well, it's pretty good! I am not sure if the boxy boatneck is the most flattering shape on me, but I really love this top. Sometimes it's not all about flattery ... sometimes it's more important to wear something that makes you feel like you are ready to bicycle around Paris in the early 1960s. Putting this together was fast and easy. The neckline is just serged, folded back and stitched, like the hems. I used a zig-zag stitch for the neckline and hems - in cream thread on cream, it is almost invisible anyway. I don't love how the side vents turned out. They look kind of ... clumpy. Next time I will draft proper side vent facings. But having pointed out all of the top's minor flaws, I have to say, I really like this shirt! The flaws are minor and the final product is super wearable. Here is the whole outfit I wore to work today. I got several compliments and felt pretty spiffy ... dare I say, almost Parisian, in my cute new top! 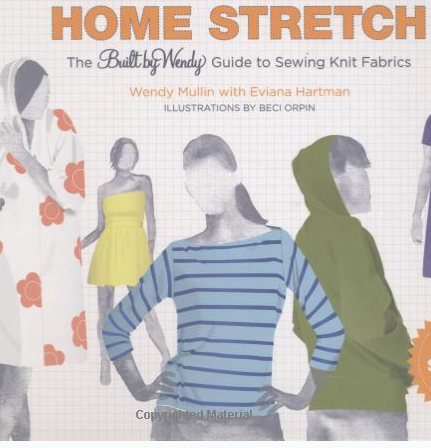 I already have plans to sew more t-shirts based on the patterns in Home Stretch, although I obviously need to tinker with the fit a little bit more. I love the idea of having a simple t-shirt pattern that I can make endless changes to, and this top definitely gave me a little more confidence to just jump in and try modifying my own patterns. Inder, this shirt looks great on you! Very Audrey Hepburn. :) I love the fabric, too! It can be surprisingly hard to find a good black and white striped knit. At least I have struggled with it. What a top! You look great! I wish I had your confidence and just modify! I feel your annoyance at having matched stripes only to then have to take something in and lose that perfect stripe matching. Aaargh! 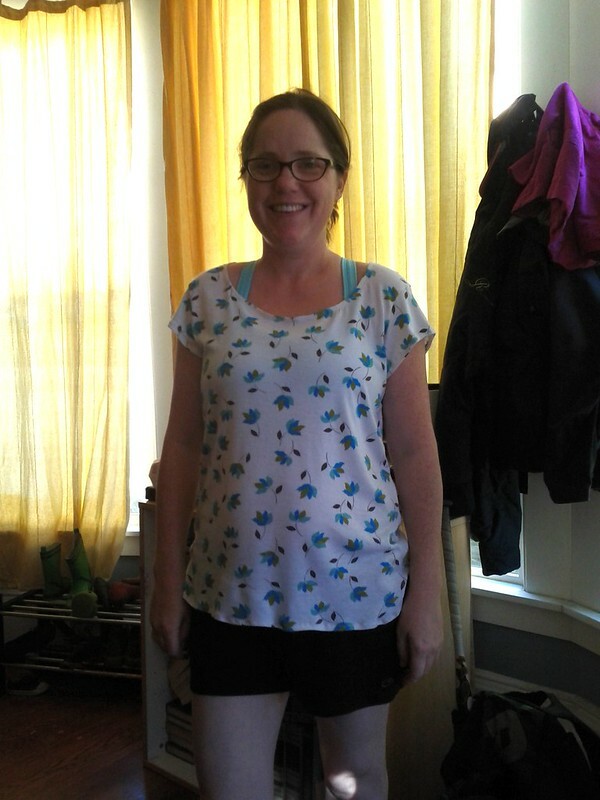 You have made a really nice top and the fabric was perfect for it. The last photo is such a lovely outfit, you look great. 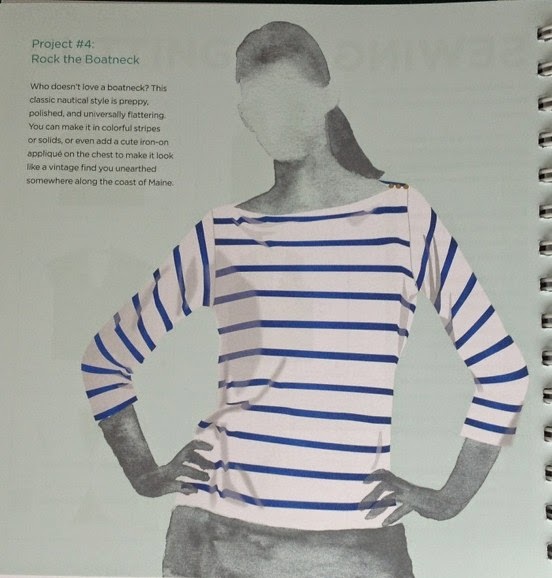 I reckon that nautical striped top picture is the main reason anyone has bought that book! I love the 3/4 sleeves and side splits you've done, plus the use of that fabric. Nice 'joggable muslin' - and I note use of word 'jog' too. Do you have an aversion to 'run' like the word 'vintage' (old)? Why does nobody 'jog' anymore - they all 'run'? Especially women 35+? Even though it really is jogging? Ah, the big questions of life. I can totally see you zipping around Paris in this! 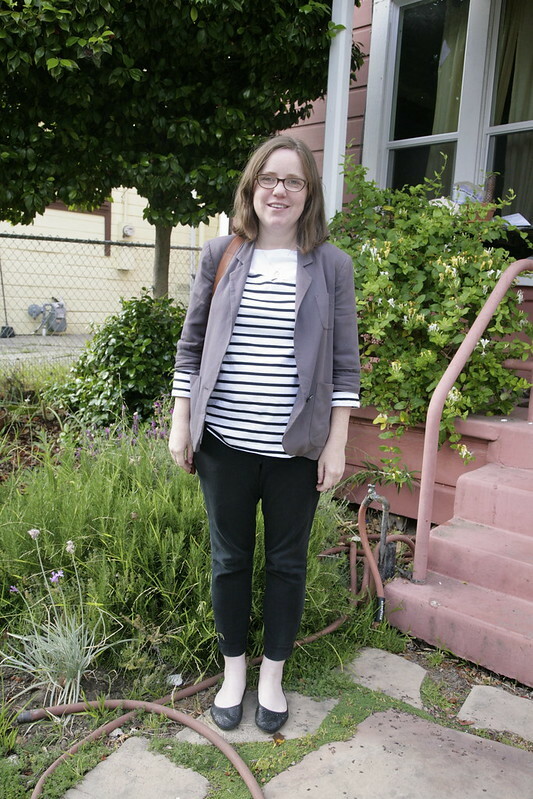 Love the style, love the stripes and it looks adorable with that blazer! Works in progress (and miscellaneous).